After the conference, I spoke with some experts in both the private and public sector about the the benefits and challenges of impact investing today, and how they apply to the Chicago context. Executive director of Benefit Chicago, a collaboration fund that mobilizes $100 million to finance the growth of impact enterprises throughout the Chicago region. He is also an adjunct lecturer of social impact at Northwestern Univesity’s Kellogg School of Management. 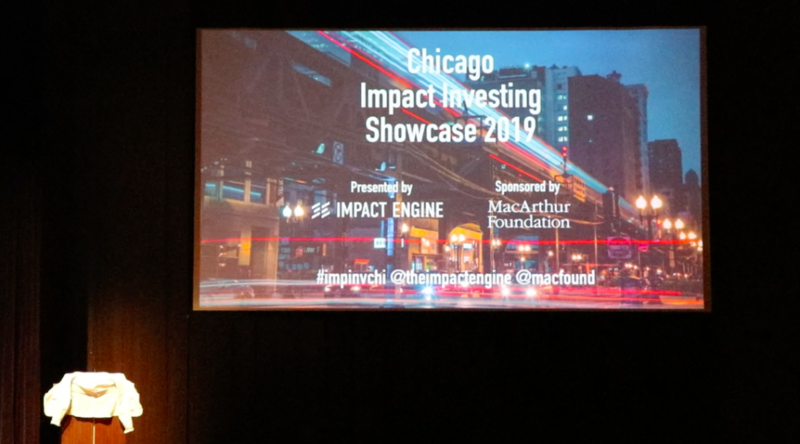 Managing partner of Impact Engine, a Chicago-based venture capital fund that identifies and invests in businesses with the potential to drive attractive financial returns and positive social impact. Director of Public Affairs at the Office of Kurt Summers, the city treasurer, who incorporated environmental, social and governance (ESG) investing to the city of Chicago’s investment portfolio. Parrish: Operating with a positive social impact can directly improve your financial returns by tracking and retaining the best talent; identifying risks early, and establishing brand loyalty. Also, some of the society’s biggest challenges are large market opportunities. Towns: Our dollars have power and we should direct those dollars towards the things that support our state and what we believe our city and country could come towards. Q: Why ESG (environment, social and governance) investing? Matuszak: Without a rigorous corporate governance, there’s a chance that people investing in the company are exposed to risk because of that. Same with companies that aren’t taking into consideration the effects of their carbon emissions and what the long term sustainability of their business model is. And that goes for a myriad of other things, whether it be workplace protections that ensure workers are safe at their jobs or corporate diversity. Q: Why is Chicago well-positioned to spearhead investing for social impact? Towns: First, we’re a knowledge capital with the second largest concentration of universities and colleges in the country. That brings young people into the city, who are really behind a lot of this movement in social impact investing. Second, we have a strong civic society. We are a city that knows how to activate, how to protest, how to march, so we have that sort of civic mindset sort of built in. Third, we’re a large city with a lot of Fortune 500 companies and a significant amount of private wealth. Those individuals with that wealth understand the importance of giving back and investing, and they participate in that in a big way. Matuszak: From the top down, we’re very involved in a lot of the issues that surround the ESG efforts throughout the city. We measure our environmental impact and lower our carbon footprint in the city. We’re a very strong union city committed to workers’ protections. We also have a city treasurer who comes from the investing world, with a lot of experience and has been exposed to complex investing ideas like this in the past. Q: What kind of challenges or pushback are there, both in the private and public sector? Towns: The traditional pushback is that businesses’ primary purpose is to generate profit because they have fiduciary responsibility to their shareholders and investors. Matuszak: Fear of change – some outmoded industries believe that our movement to encourage good behavior in the energy sector was a movement to disinvest in the energy sector, which is just not the case. Also, when you get into ESG scoring, you’ll find that disclosure across all industries vary a lot. So we had to dig deep to figure out how to get to a place where we feel like we’re getting enough disclosure so that we’re making well-informed decisions. Q: Any suggestion on how to meet these challenges? Towns: We think expanding the pie on who the shareholders and stakeholders are in the business allows room for these types of investments to really prosper. Expand who you believe the shareholders are so that they could also include employees, the community in which the business sits, your neighbors and others. Matuszak: I think the ESG movement demands that people in the private sector who are in private equity or hedge funds start developing these disclosures before going public, so that when they do, they’re able to say, ‘here’s what we can tell you about our carbon footprint, here’s what we tell you about our board diversity, here is how our workplace protections are already in place,’ so they’re not waiting until it becomes an issue when they’re trying to go to market.